Durslade Farm in Bruton, Somerset, is the latest outlet for the international art dealers Hauser & Wirth. In 2013 they commissioned Dutch plantsman Piet Oudolf to design a garden for the gallery. The plants were supplied by our favourite nursery, Orchard Dene, and the garden was planted in the spring of 2014, one of the wettest on record. Those of you familiar with Oudolf's style will not be surprised to see huge borders of long-flowering perennials with little in the way of traditional structural plants like evergreen shrubs. For those of you not familiar with his style the garden can appear unstructured and lacking in focal points. There tends not to be the huge summer climax followed by assiduous cutting back, pruning and tidying that we are used to in traditional English gardens. Rather the garden starts slowly in the spring. But once the perennials get going there is wave after wave of billowing flowers and grasses. As summer moves into autumn the seed heads of faded flowers start to predominate. 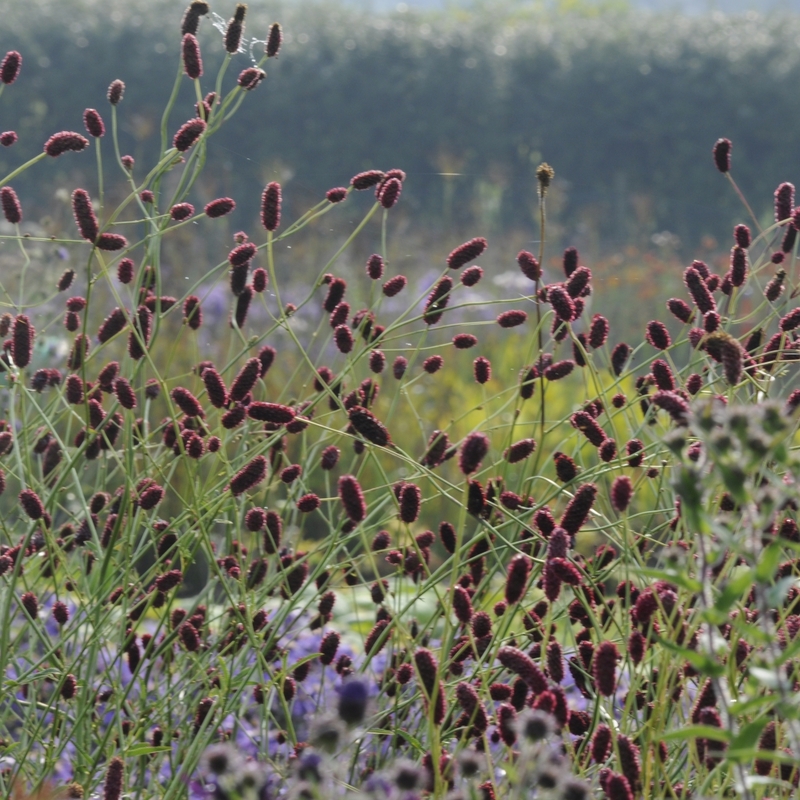 Rather than cut them back Oudolf leaves the seed heads to stand as long into the winter as possible. Indeed, Oudolf selects his plants as much for the way they move into senescence as he does for their colour in high summer. September marks a shift in focus from colour to form. Here we can see the seed heads of Echinacea pallida silhouetted against the still frothy flowers of Deschampsia. 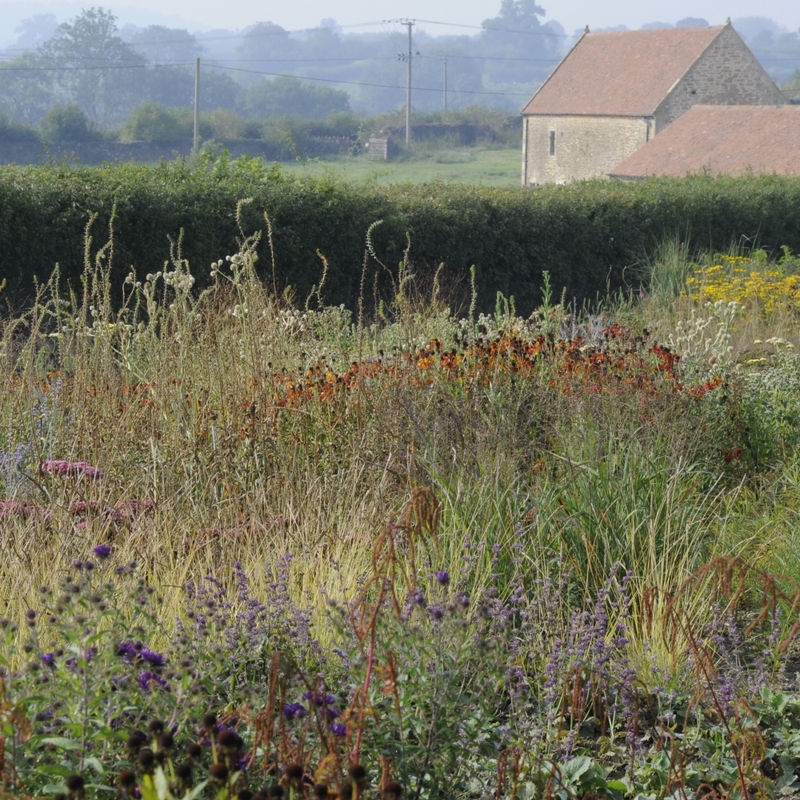 Oudolf is not obsessed by mixing and matching colours but by combining shapes and textures. There are few tradtional English gardeners who would put orange and pink in the same view but here Oudolf is contrasting the cone shaped flowers of Helenium Moerheim Beauty with the flat heads of Sedum matrona with some fluffy Pennisetums and amorphous Asters. This way of designing with plants has been termed "The New Perennial Movement" and Oudolf is its pre-eminent practitioner. The most notable way of imlementing this idea is with "block" planting - single species in large groups to make a big impact. As an idea it has been going longer than I've been a garden designer and it has influenced my own planting design. 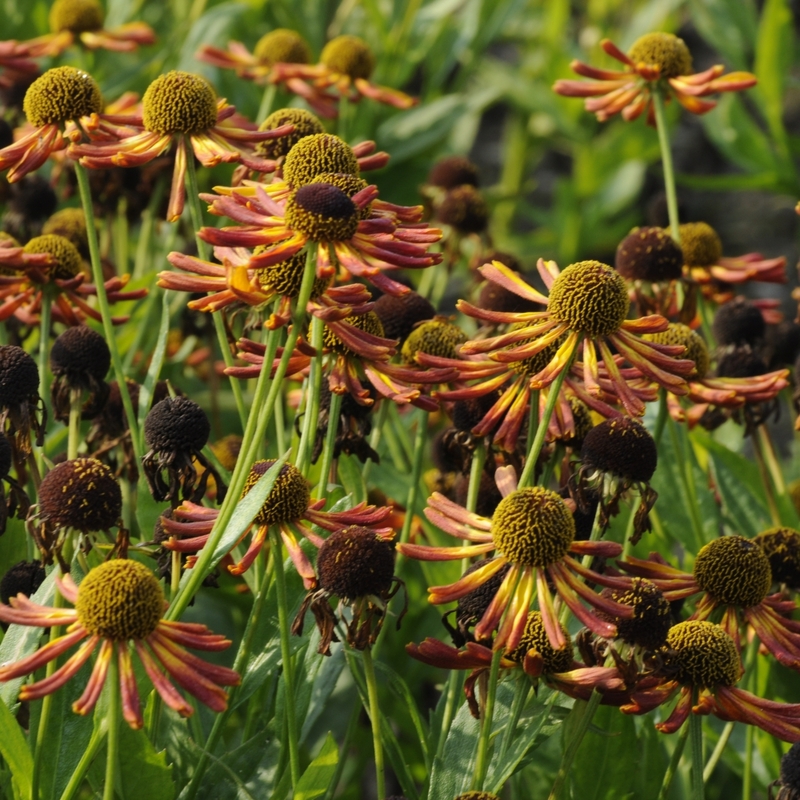 Oudolf's ideas have not remained stuck in a rut however. He has picked up on the scientific developments in matrix planting. This is based on the work carried out primarily at Sheffield University by Professors James Hitchmough and Nigel Dunnet and also by Dr Noel Kingsbury. Matrix planting combines plants that do not compete with one another. They may flower at different times and have completely different forms and, to a certain extent, different requirements in terms of light and water. A lot of their research was brought to bear on the summer meadow planting at the Olympic Park in 2012. Matrix planting produces more of a tapestry effect and at Hauser & Wirth Oudolf has used block planting in some borders and matrix planting in others, to great effect. Enough of the garden design theory. It was a beautiful day when I went with friend and fellow designer Lisa Cox. There was thick fog most of the way from London but it was just starting to lift as we arrived. The garden didn't open until 10am so we had to amuse ourselves with second breakfast and a walk around the gallery. The sun was hazy and at a low angle, perfect autumn weather. Its always a difficult balance between looking at the whole garden, taking it all in, and looking at parts of the garden through a lens. Photography does focus your concentration though and makes you look at things you might miss on a broad sweep across the garden. However, it does also mean that people don't always recognise the garden you are photographing as they are not looking at it in the same way. 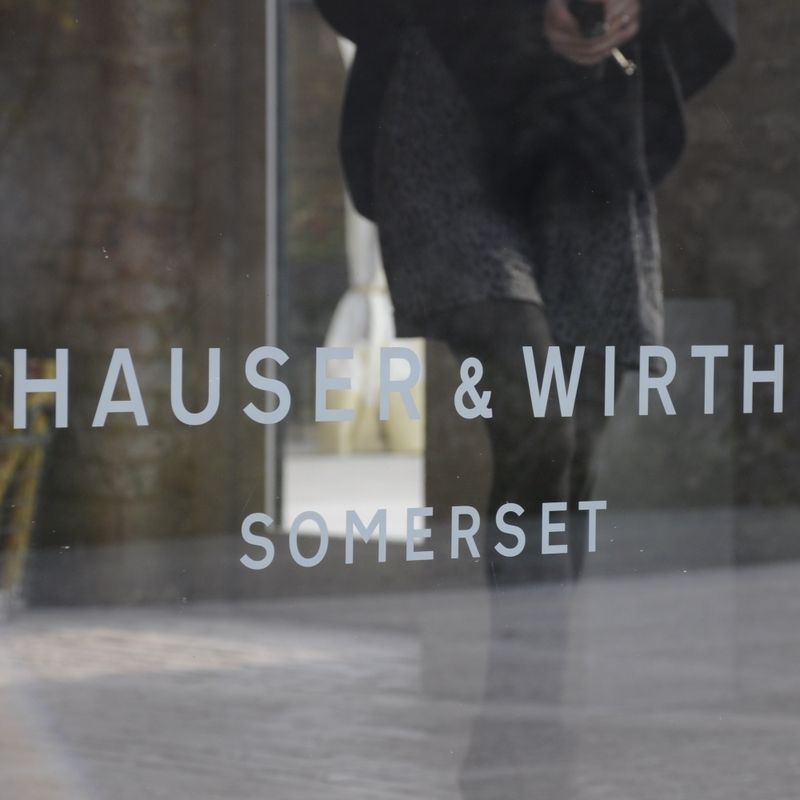 Hauser & Wirth in Somerset is primarily concerned with art. There is some sculpture outside, some more successfully placed than others. The giant clock in the garden is a bit wierd I think but the spider in the courtyard is striking. There is a book shop and of course, a cafe and restaurant. As we were there early there was time for second breakfast of coffee and toast and jam. Reasonably priced, tasty and in an art-filled cafe, I enjoyed it all. The farm buildings have been restored in a fabulously rustic/trendy style - lots of concrete, wood, clay tiles and old brick walls. The Hauser & Wirth experience is not to everyone's taste of course, one client described it as "a pretentious place, nasty art and not at all my idea of a garden!". I can't do anything about her taste in art but I do hope she'll go back and have another look at the garden.